Sometimes you just lose steam on a project. This can be for a variety of reasons. This manticore figure has sat on the "part done" pile for what might actually be a decade. Started a new album entitled Prehistorics. First entries are the Trogs or Cave-Orcs. Sometimes the simplest shapes turn out to be difficult to paint because the margin of error is so small. In the last blog I mentioned that the Kren chapter insignia could be difficult to paint on pauldrons. Last night a new way of doing this occurred to me so I tried it out. I have painted a lot of space marines over the years. Judging from the contents of the boxes in my room, I will be painting many more! What have I learnt painting these and what would I change if I did it again? Stunned how little painting I have got done this year. Two of today's uploads were Christmas presents! A change of subject from my last upload, but also long legged and deadly! 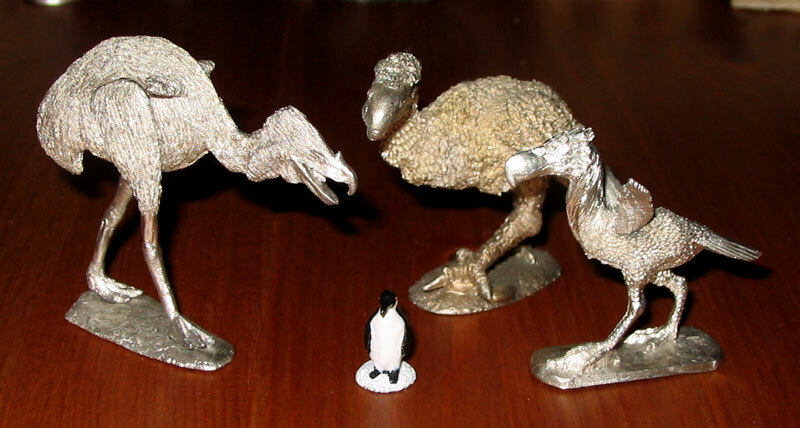 Some time ago I came across a photo of some Phorusrhacid birds on the website of Steve Pugh.